We also have other kigo with the haze (kumori, -gumori 曇り), meaning a cloudy day. 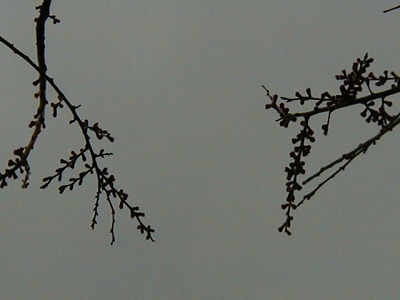 KUMORI is usually used for an overcast sky. At the side of the Nihonkai in Hokkaido, from March till May, when the fishing season for herring starts and the sky is mostly overcast. The weather is still unstable and many a fishing boat is lost in a sudden storm. In recent years, the catch has become smaller and smaller and less sons take up the family fishing business in the area. This is a rather local kigo. Do not mix this with the "sardine clouds", iwashigumo, or mackerel clouds, named for the shape of the clouds. In the clouds, the birds. ?In the birds, the clouds. "It is evening. Basho is on a journey, his last; half a month later he will be dead. ... The onomatopoeia of this verse is striking; Basho sounds as if sobbing or choking." "Written ten days or so before his death. The middle phrase is "nande toshiyoru," also possibly, "why am I so old?" or "why do we grow old?" Robert Aitken translates it in "A Zen Wave," "Somehow I have grown old." The last phrase is "kumo ni tori," literally, "to the clouds, a bird." Commentators have found it inexpressibly poignant. I can't find, and haven't seen, an adequate rendering." Written on the same day and at the same place as the previous hokku." headnote: "Expressing how I feel"
In the exerpts from the seven commentators from whom Ueda quotes, none mentions a mixing of kigo, or that "kumo ni tori" is a traditional spring kigo. "The concluding phrase presents a bird disappearing into the clouds, a solitary bird that looks like a fading speck. In relation to the rest of the poem, the phrase creates a kind of shock effect. The effect is more forceful than that of juxtaposition, so forceful, indeed, that it seems to make sparks fly. The poet succeeds in conveying a deep allegorical message about human life." I wonder if Issa (see the HAIKU below) might have changed the phrase in his haiku from "kumo ni tori" to "ten ni hibari" because of awareness of Basho's use of the phrase. The migrating birds of autumn seem to be sucked up and disappearing in the clouds. The poet's own life seems also to come to an end. Flying towards the clouds, a bird. "I am sorry to have to leave you now. I hope you will live a happy life under Mataemon's care and reach a ripe old age. There is nothing more I have to say." The only thing that disturbed his mind was poetry. According to a disciple's record, Basho fully knew that it was time for prayers, not for verse writing, and yet he thought of the latter day and night. Poetry was now an obsession - "a sinful attachment," as he himself called it. Jean Cholley sees this as a scene of people gathering shellfish at low tide. At the end of Third Month seabirds have migrated north ("in the clouds"), leaving good pickings for the humans; En village de miséreux: Choix de poèmes de Kobayashi Issa (Paris: Gallimard, 1996) 234, note 9. Issa later (1795) revises this to begin with "larks in the sky" (ten ni hibari). Larks are not migratory birds. Sakuo Nakamura notices the "interesting contrast" between the vertical (birds in the clouds) and the horizontal (the sea). And the poem ends, he adds, with the psychological: it's a holiday, no work! 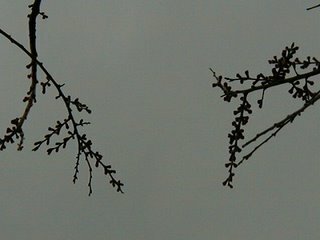 Sometimes they fly so high, we almost loose sight of these first harbingers of spring. Then they plunge straight down, back to earth. They sit on the electricity lines of our home and twitter happily for a long time. Meadowlarks are birds belonging to the genus Sturnella in the New World family Icteridae. This genus includes seven species of largely insectivorous grassland birds. In all species the male at least has a black or brown back and extensively red or yellow underparts. 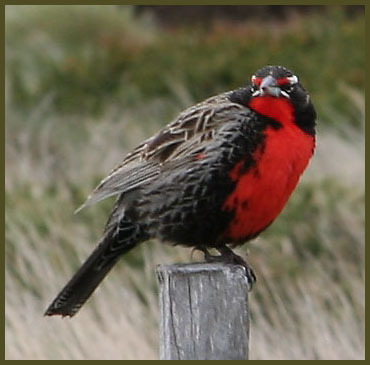 The meadowlark is the representative bird for the state of Wyoming. ...we see in Issa's holiday haiku in spring time. Oh, it's geeting dark. It's autmn of my life and I've been getting old against my will. Birds and clouds are in the sky. But here I am alone on the earth and wondering about my old age, right? This could be one reading or an interpretation. There could be some other reading as well, for example, the haijin might have implied his death by "kumo*" and getting rid of this world by "tori" i.e. vehicle of spirit and soul. くも kumo means not only cloud but also smoke of cremation, hence death as well. About cloud, I'd like to refer to the famous poem by Dogen the founder of Sotoh Sect; the great master composed this poem 20 days before he died, when he had the last glimpse of the Eiheiji Temple on his way to Kyoto ...where he was to have medical treatment; he had been ready to die any moment, but was willing to have medical remedies available for him. but in the last 7-7 syllables we have "cloud" i.e. Dogen or Monjyumaru is said to have made up his mind to be a monk when he saw incense smoke that was dedicated to his dead mother. If you have one more push, you might have "there is the way"